A rendering of the paper airplane shaped bandstand that will sit at the southern part of the park. Overland Park is moving ahead with plans to redevelop its downtown Santa Fe Commons Park to include more open play area, an outdoor work environment and a paper-airplane inspired performance stage, despite a last-minute protest from some residents. The city planning commission voted unanimously on Monday to approve a park development plan that will also remove the gazebo and reduce the number of trees. When it’s finished, the park at 8045 Santa Fe Drive will be renamed Thompson Park, after Frank and Evangeline Thompson, who donated $1 million — or about a third of the cost — of redoing the park. Before retiring, Thompson was a long-time Metcalf Avenue car dealer. Resident Ralph Beck presented signatures on a petition protesting the park design and plan to rename it after a businessman who made a donation. The loss of the gazebo and the renaming were two ideas most disliked by Overland Park resident Ralph Beck, who organized a protest against the plan before the commission. Beck presented 194 signatures against the renaming at the commission meeting that he had collected in several downtown shops. He also shared mostly negative comments about the park plan from the “We Grew up in OP” Facebook page. “Downtown Overland Park is the nearest thing we’ve got in the city of Overland Park that you could call a historic district. And it seems like our historic character down there is at risk of gradually being erased,” Beck said. Beck said he had hoped to get the city to reconsider the renaming and revise the design plans of the modernistic paper airplane stage reflect the appearance of the historic Strang Carriage House, which will remain part of the park. But planning commission members countered that there were well-attended listening sessions and other efforts to get citizen input on the park plans for the better part of a year. The park had been considered a possible site to relocate the downtown Farmers Market for a time, but that idea was eventually dropped. The paper airplane design recalls an aviation field that was near downtown early in the city’s history, commissioners said. “It’s a piece of art and art doesn’t have to be something everybody loves uniformly. It’s meant to spark debate. It’s meant to be iconic and create some discussion,” said planning commission member David Hill. The gazebo at Santa Fe Commons will be torn down as part of the park renovations. Planning commission member Rob Krewson said he could understand the unwillingness of some to see the gazebo go. “The existing gazebo has been the location of many memories for people and so they have a passion for keeping those. A new iconic location brings new memories for the people,” he said. Beck was one of only two to speak at the public hearing on the park plans. Constance Meis-Robertson told commissioners she appreciated the public listening sessions but still had some concerns. The tornado siren nearby could be deafening for children in the park, she said, and she also worried that the stage would block visibility at the intersection for people exiting Santa Fe Towers apartments. Landscape architect Bruce Niedermyer said the stage won’t affect that visibility. 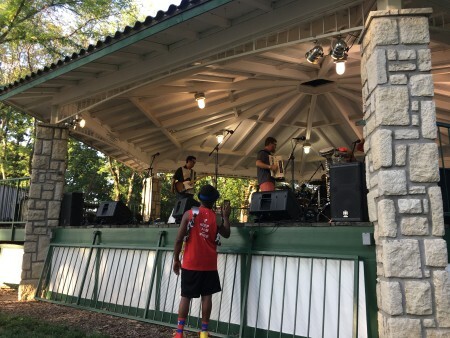 The gazebo is too crowded for many of the music groups that perform there, he said, because it was built primarily as a shelter. The park’s redo will also result in fewer trees overall. Plans call for 44 of the roughly 200 trees to be removed. Several of them are diseased or damaged, he said. The city will put young trees in their place, with many of those growing to a comparable height, he said. Still, the end result will be a park with more open space and fewer big trees. Hill noted that city forester Bailey Patterson replacing all of the 44 trees would not leave enough room for the new park features. The planning commission didn’t discuss the renaming because that is not something it has authority to change.